It was a company show in the kitchen last night–the main roles were being played by our friends, Romaine and Mai-Britt–much to my delight! I was offered the small but important role of sous chef and general presence! 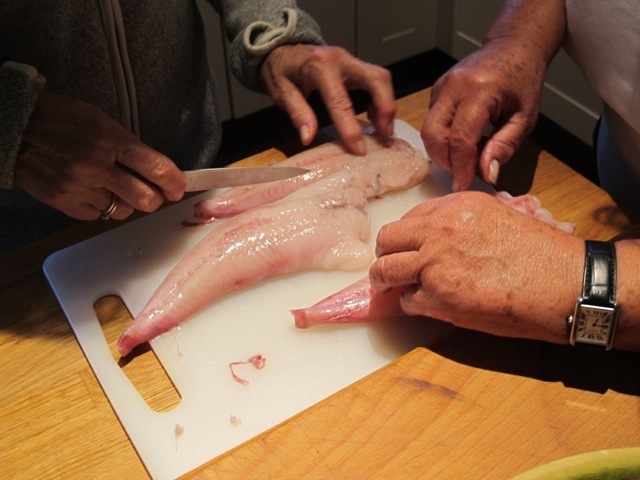 They picked up the pre-ordered fish from M. Gayraud in the market yesterday morning and although the monkfish (lotte) tails had been thoroughly prepared, they meticulously peeled back the thin skein of skin still clinging to the flesh, something I am not always so careful with–their attention to detail paid off. 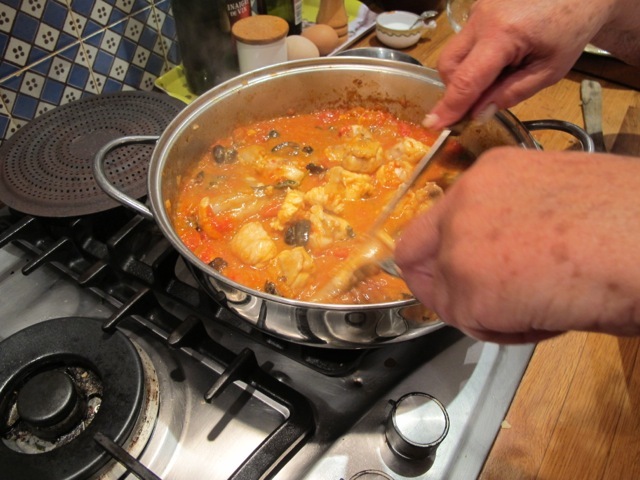 They were cooking this handy dish from the proofs of my NEW book, Healthy Eating for Life (due out in January 2014): Monkfish with black olives in a smoky paprika tomato sauce. 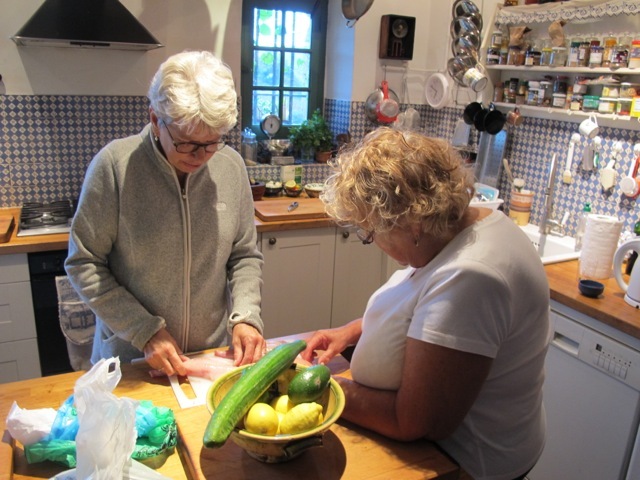 It is relatively simple–but in any case we had expert “guest cooks”! 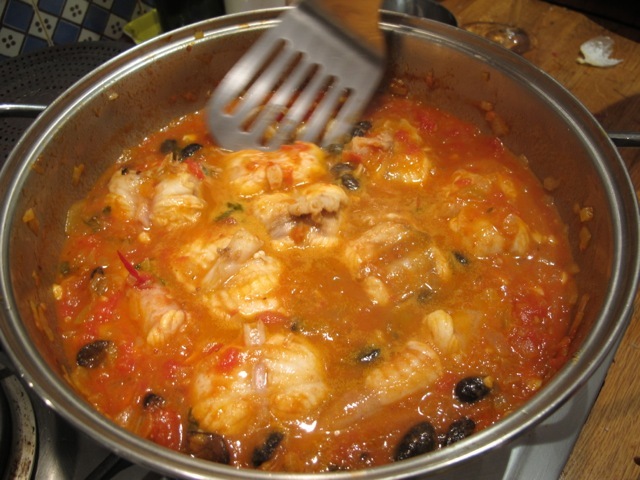 The sauce can be prepared beforehand and reheated when you are ready to add the fish. That’s the beauty of it. Good for entertaining, as most of the work is done ahead of time. And that’s what my team did–because it was Saturday evening and Strictly Coming Dancing on BBC TV was too tempting to miss–they’d been following it for weeks. With the sauce made and sitting happily melding, hunger proved the only nagging worry–in time drawing the team back to the kitchen. There was left over roast ratatouille and basmati rice in the fridge to which I added some sautéed courgettes–perfect as an accompaniment. 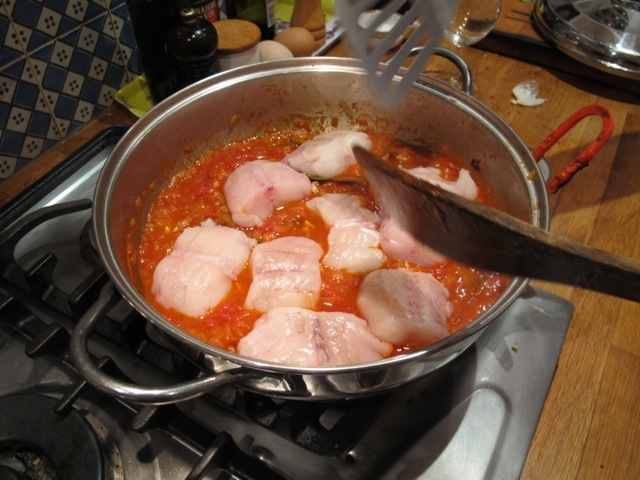 Soften the onion in the oil using a sauté pan large enough to hold the monkfish (later)–about five minutes. 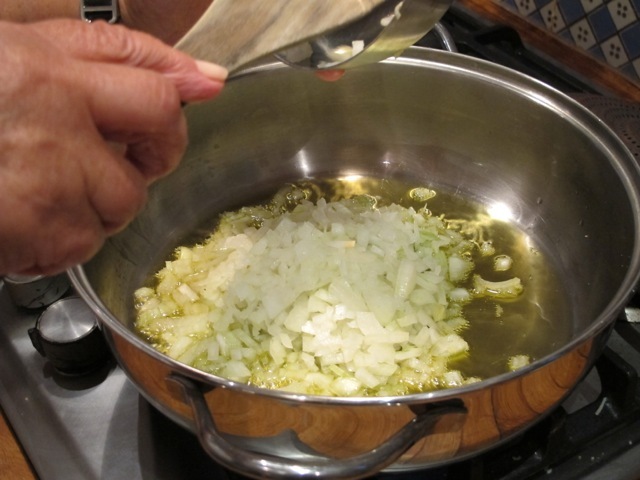 Add the garlic and cook a further three to four minutes. 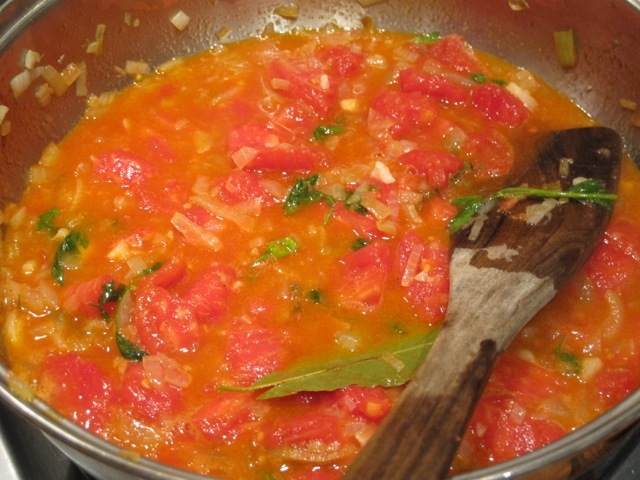 Add the tomatoes—which you have broken up–with the spices, herbs and salt. Cook these gently for a couple of minutes. Add the wine and cook another couple of minutes. 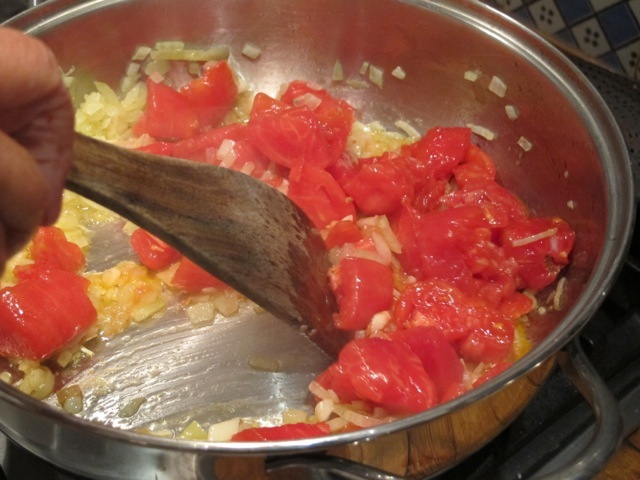 (Romaine says next time she’d cook the sauce longer–I’m not sure I agree, especially if you are using fresh ripe tomatoes; chacun a son gout!). This makes the simple base in which to cook the fish. A few minutes before you plan to eat, reheat the sauce and add the olives. Slide the monkfish pieces under the sauce and cook on low heat, covered, for 5 to 10 minutes until the fish is opaque–and you can’t wait any longer! Monkfish is a treat that I’ve rarely found here in the northeastern US, but we have enjoyed it many times in South Florida. I am determined now to find a monkfish! What a delectable recipe for the autumn . . .thank you! Sounds like a great sight. Delicious recipe! Definitely one to try soon! Sad news about Tom Hanks and his recent Type II diagnosis – time t send him your fabulous book! Meredith suggested the same thing! As the ad says: Just Do It!!! The book, recipes and the message you have managed to bring to the debate table (no punintended) has been a wonderful leap forward! Well Done! Really enjoy opening my Inbox to find yet more delicious postings!